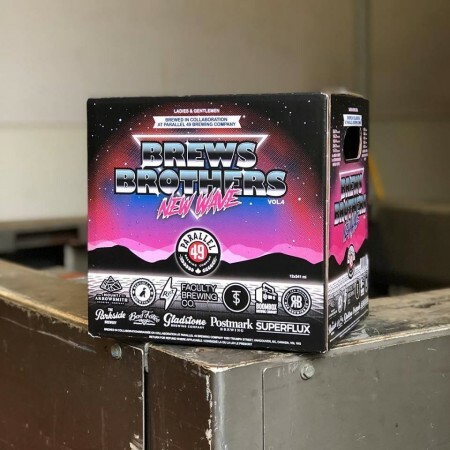 VANCOUVER, BC – Parallel 49 Brewing has announced the release of Brews Brothers Vol. 4, the latest edition of an annual mixer pack of beers brewed in collaboration with other craft breweries. Brews Brothers Vol. 4: New Wave is available now at the Parallel 49 retail store, and will be in stock at select liquor stores in British Columbia and Alberta soon. Release parties for the pack featuring all 12 beers on tap will be taking place throughout the first half of April at venues including Smiths Bar & Restaurant in Victoria (April 4th), Darby’s Pub in Kitsilano (April 5th), St. Augustine’s in Vancouver (April 5th), Cornerstone Cafe & Tap House in Courtenay (April 7th), and 12 Kings in Vancouver (April 13th). For more details, see the Parallel 49 Facebook page.